While most of us are snug in our beds, some of Portage County’s finest are working to keep our roads safe. Over the last two weeks, Portage County ‘s snow plow operators have put in over 120 hours, that is like working another whole week. These workers start at 4 a.m. and sometimes do not get home till 10 p.m., leaving their kids to wake up and go to bed without dad being there. Thursday, Feb. 7, I had the opportunity to ride along with Scott Jochman, a county plow operator, on his route in east-central Portage County. We plowed parts of Highway K, Q, D, T, and DD. While I was riding with this very skilled operator, I made a few observations. First, it is very hard to see when you are plowing snow. We met several cars without their lights on. A second observation was, the number of times Scott had to slow down and maneuver around garbage cans left on the shoulder of the road. If it is not garbage day please pull your cans away from the road. The last observation was the amount of maneuvering it takes for a plow operator to properly clean an intersection, it includes a lot of backing up and being aware of your surroundings. As the winter storms continue to ravage our area please do me a favor and help our operators out. 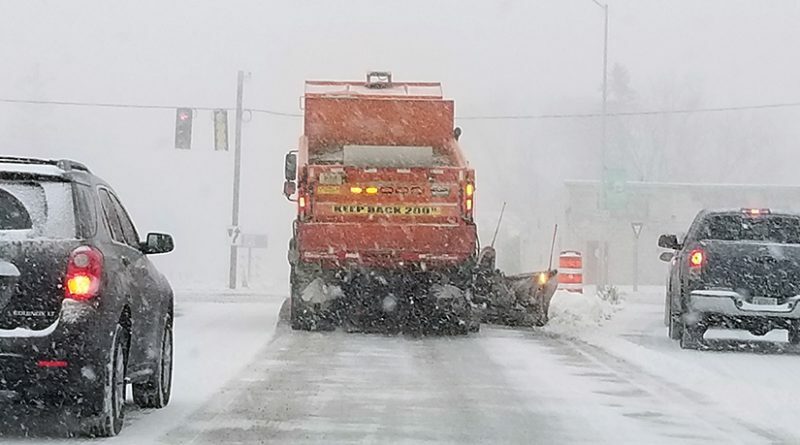 Turn your lights on, when meeting a plow slow down and move over as far right as you feel safe doing, and do not tailgate the plow truck, if you can’t see the plows mirrors, the operator can’t see you. Again, thank you to all township, village, city, and county snowplow operators for your sacrifices so we can get to where we need to, on time and safe.